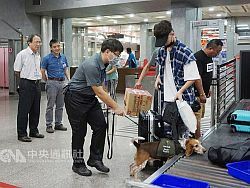 Taipei, Nov. 8 (CNA) The maximum fine for illegally bringing meat products into Taiwan will be increased from NT$15,000 (US$489) to NT$300,000 to better prevent Taiwan from being affected by African swine fever (ASF) or hoof-and-mouth disease if a proposed amendment passes the Legislature. The Cabinet on Thursday approved the draft amendment to the Statute for Prevention and Control of Infectious Animal Disease to increase the fine, which an official with the Bureau of Animal and Plant Health Inspection and Quarantine (BAPHIQ) said “has little deterrent effect” on smuggling. In the wake of outbreaks of ASF in China first reported Aug. 3, Taiwan has intensified border inspections of meat products and discovered 148 cases of people illegally bringing in raw or undercooked products between Sept. 1 and Nov. 4, Feng Hai-tung (馮海東), head of the BAPHIQ, said at a press conference.